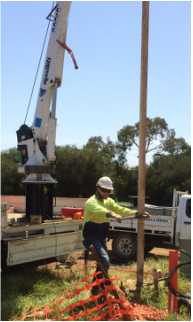 Drilling a new water bore - regional Australia. Drilling a water supply well for a vinyard. 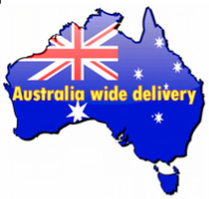 waterborepump.com.au is made up of a group of drilling professionals Australia wide that have each been in operation for over a decade. 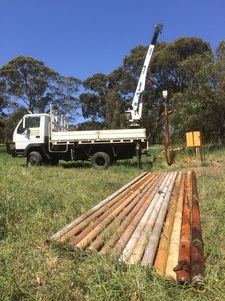 We are specializing in the drilling of Water Supply Bores, De-watering, Groundwater Monitoring Wells, Earth Stake Installation, Geothermal Ground Loops and the supply and installation of pumps and control systems. Like all things, existing water bores, sandspears and pump systems need maintenance from time to time. It is worthwhile having your system checked at every few years to ensure it's continued safe and efficient operation. Your pump may need servicing or repairs and a full service is provided in this regard. Retrieval of submersible pumps with our custom built Pump Hoist is our specialty, with capabilities of hoisting submersible pumps from depths in excess of 100 metres. Nobody knows more about water bore drilling!